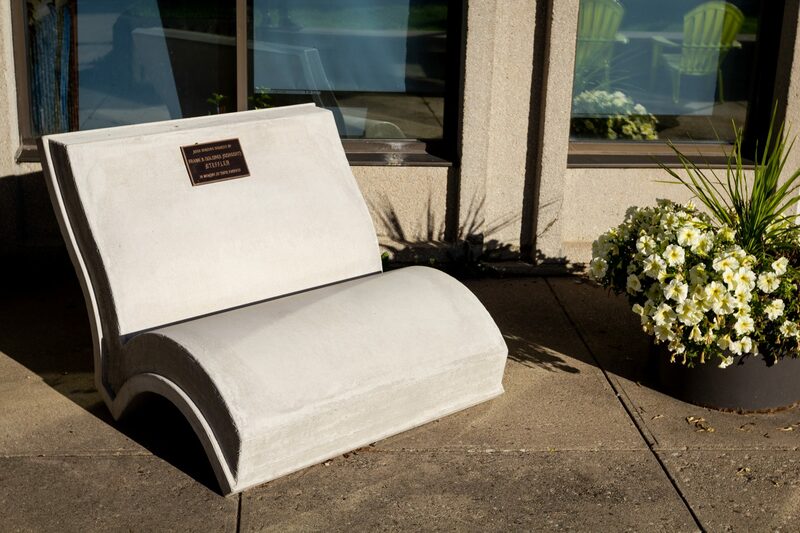 Two new “book benches” have found their place at the Waterloo Public Library (WPL) thanks to the heartfelt donation of Frank and Delores Dorscht Steffler. The couple donated the benches as a way to honour the memory of their parents: John and Mary Ann Dorscht and Leander and Rose Steffler. Although they were delivered and placed during the beginning of summer, the benches have not been officially unveiled as of yet. However, the Waterloo Library displayed the benches on their Twitter once they were placed with plenty of positive feedback. Anjana Kipfer, WPL marketing and communications manager, discussed the upcoming unveiling ceremony which will take place Thursday Sept. 20 at the main branch of the Waterloo Public Library at 10 a.m. She has worked at the library for five years and graduated from Wilfrid Laurier University in 2001. “We thought it was a fantastic idea, they had this idea about the book shaped benches, which we felt was perfect,” Kipfer said. “Mayor Jaworsky is coming to the ceremony, and the chair of our library board, Karen Coviello Scian, will be there as well. And hopefully, the Stefflers will be there as well if they can make it,” Kipfer said. The idea for these stone benches arose when Frank and Delores decided to commemorate their parents with a donation. They were directed to the library early in the summer shortly after expressing interest in commissioning something special for the city. They are avid supporters and advocates of the library which made their request especially compelling to the library management. The couple and the library worked together with Ed’s Concrete, a company out of Stratford, in order to commission the benches. A bronze plaque engraved with the couple’s names has also been recently added to the bench in preparation for the dedication ceremony. Although the relationship between the Steffler’s elders and the library is unclear, Kipfer believes that Frank and Delores’ parents were supporters of the library the same way their children are, and many admire how they are so eager to give back to the community with these various donations to local sites. The Stefflers have also donated to other organizations across the city, including another bench for the Parkview Cemetery where their parents are buried. “One of the notes that Frank had sent me, he said, he felt that they really wanted to honour their parent’s memory and do this kind of thing in their spirit,” Kipfer said.